Bouldering at the Ledyard Glacial Park is always a blast, and surreal when you go on a too warm winter's day, as so many have been over the past few months. In a ravine here is an extraoardinary sight: hundreds, perhaps thousands of huge boulders, strewn about as if they had dropped from the sky. They all appear to be the same variety of stone, between five and twenty feet long and of comparable mass, share the same coarse texture and light gray color, and are finished magnificently with a patina of lichens and moss. The park is a unique exposure of the Hammonasset-Ledyard-Queen's River recessional moraine, leftovers of the last Ice Age, from the time when the great Laurentide Ice Sheet that once covered southeast Connecticut began to melt out of the Ledyard area about 18,000 years ago (according to a new estimate by Greg Balco, of the University of Washington, and Joerg Schaefer, of the Lamont-Doherty Earth Observatory of Columbia University). This moraine is one of five recessional moraines along the state's southeast shore deposited more or less perpendicular to the direction the ice followed south. It runs along a line from Hammonasset State Park in Madison, slightly northwest through Ledyard, to Queen's River, Rhode Island. 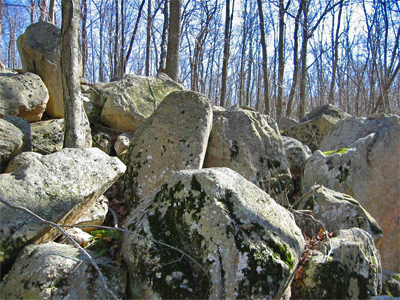 The boulder field at the Ledyard Glacial Park. The moraines record not just how the glacier retreated in starts and stops, but tantalizing clues about how the ice dropped the burden of rocks and gravel it picked up during its advance. How the boulder field here at Ledyard came to be, for example, is a bit more mysterious than how Hammonasset came to have its rocky beaches. The story begins with the Laurentide Ice Sheet originating far to the north, near Hudson’s Bay Canada, and expanding until it came to cover New England and all of Connecticut sometime between 20,000 to 25,000 years ago. Along the way, mixtures of sand, gravel, rocks and boulders were frozen in the ice, picked up in the glacier and transported south. Where it reached its southernmost limit, the glacier deposited its terminal moraine to form large portions of our outer shoreline, from the south shore of Long Island, east to Block Island to Martha's Vineyard and Nantucket, and Cape Cod. From there, the five recessional moraines periodically record the margins of the shrinking ice sheet. The Hammonasset shoreline (left) and glacial till beach material. Photos by Connecticut geologist and author Greg McHone. 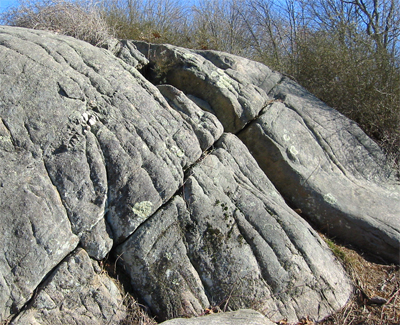 The boulders at Ledyard Glacial Park are mostly huge blocks of gneiss and granite gneiss piled on top of one another, without much in the way of smaller-grained sediments or till. Despite their size, these very large-grained boulders are neatly rounded and smoothed, as you'd expect them to be if they were transported by ice. 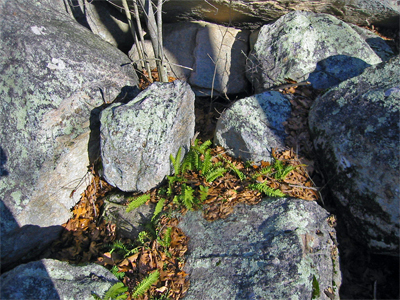 Unlike at Hammonasset, the bedrock at Ledyard is not deeply buried beneath till, but exposed as ledges beside the ravine and near the power lines just east of the park. 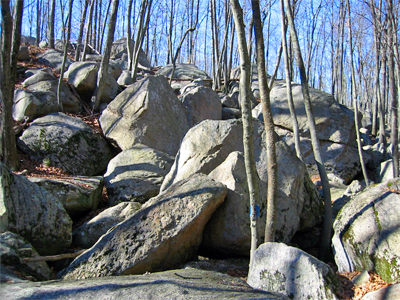 The composition of the boulders and bedrock is similar, so it's reasonable to expect that most didn't come far, and that the source material is nearby. Looking back up the ravine at Ledyard Glacial Park. They are “presumably the result of widely spaced joints in the source outcrops, which provided a disproportionate number of large boulders,” writes Greg Balco. The following photo shows how the ice may have exploited existing bedrock faults and fissures to pluck large chunks. 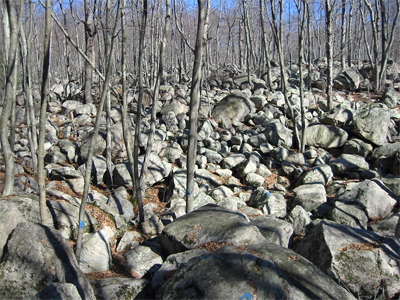 As for the clustering of boulders, Richard Goldsmith of the USGS described one possible explanation in a 1987 paper: “Sorting of this material by slumping was contemporaneous with winnowing by meltwater, possibly in a crevasse." Cracks in a bedrock outcrop at Ledyard Glacial Park. On the way out, don't forget to visit the kettle hole that is a short walk from a parking area on Avery Hill Road. Kettle holes were formed where glacial till came to be deposited over a mass of ice that became stranded or was left behind during the glacier's retreat. Insulated in an enormous cooler, the stranded block gradually melted away, leaving a large bowl-shaped depression, kettle, or hopper in the landscape. The kettles along Avery Hill Road were formed by blocks of ice that remained just north of the moraine as the front of the active ice retreated from the area.